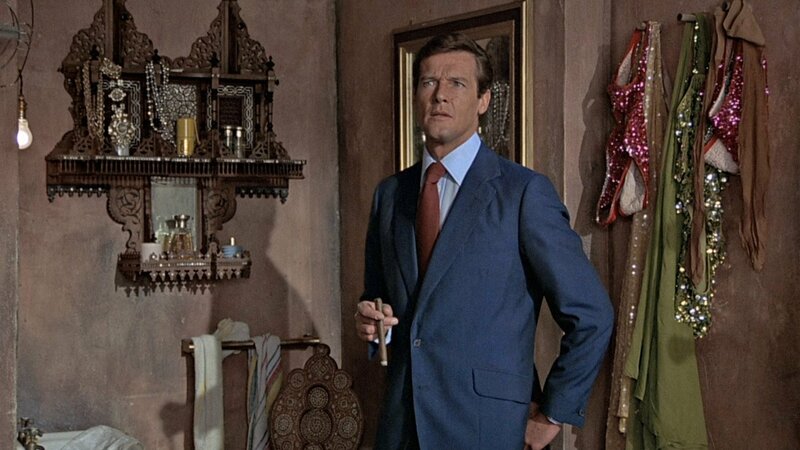 Continuing from where Sean Connery left off, Roger Moore’s suits are made of many of the same types of fabrics that Connery’s are. Like Connery, Moore wears a lot of lightweight worsteds and medium-weight flannels. And like Connery, even Moore’s suitings can be traced back to Ian Fleming. 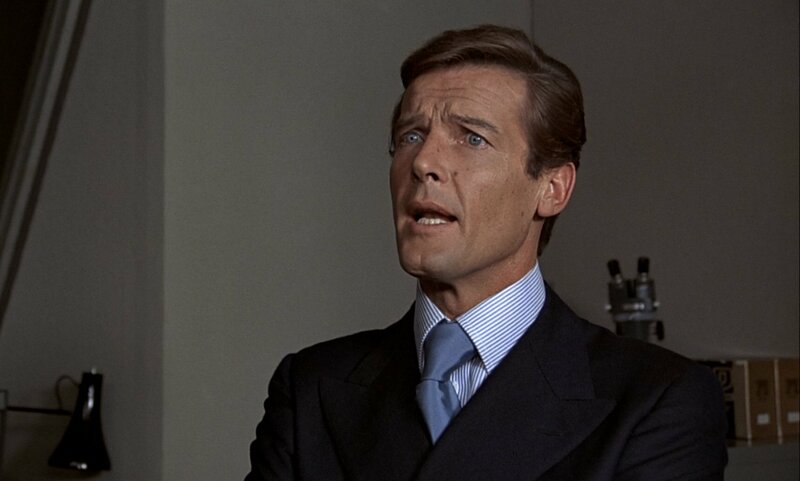 Moore’s first suit in 1973’s Live and Let Die is the “dark blue light-weight worsted” that Fleming dressed his James Bond in. However, throughout the 1970s, Moore placed more emphasis on wearing the more luxurious fabrics that Connery wore only occasionally. Connery wears one dupioni silk suit in From Russia with Love, but Moore wears a silk suit in each of his four Bond films of the 1970s. Mostly in greys except for a bold light brown suit in The Spy Who Loved Me, these dupioni silk suits are ideal for the warm locales that Moore’s Bond visits. Dupioni silk is a fabric full of slubs—nubs and irregularities—like shantung silk but with a dull sheen instead of a shiny finish. 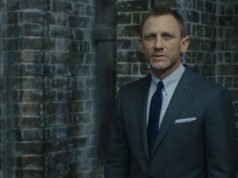 These silk suits portrays Moore’s Bond as someone who has the best tastes. 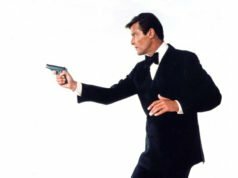 Moore Bond’s fascination with silk even influences his evening wear, and he wears an ivory dinner jacket in dupioni silk in The Man with the Golden Gun. 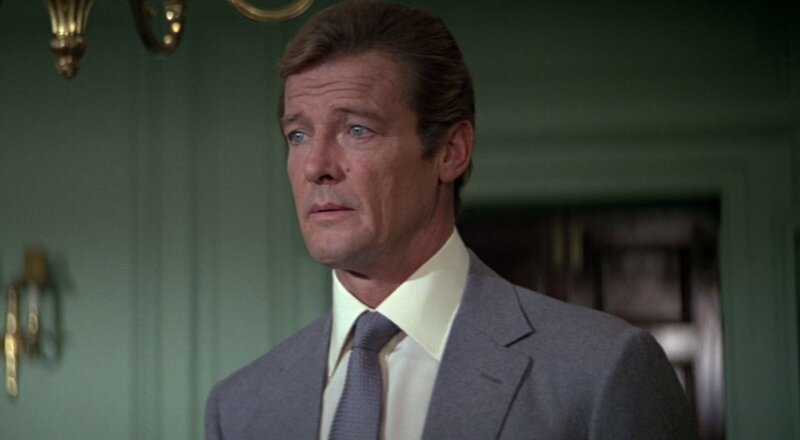 Like Connery’s Bond, Moore’s Bond also was a fan of mohair and wool blend suits, wearing a few of them in The Man with the Golden Gun when they were still highly fashionable. In The Spy Who Loved Me and Moonraker, Bond returns to the wool-and-mohair dinner suit. Throughout the 1970s, there are no limits to the colours of Moore’s suits. The many greys that he wears range from light to charcoal, following the grey-suit standard that Connery set at the beginning of the Bond film series. Moore also wears a few suits in blue, from navy to marine. Then there are the earth tones that Moore is infamous for wearing in the 1970s. These include beige, light brown, medium brown and olive. 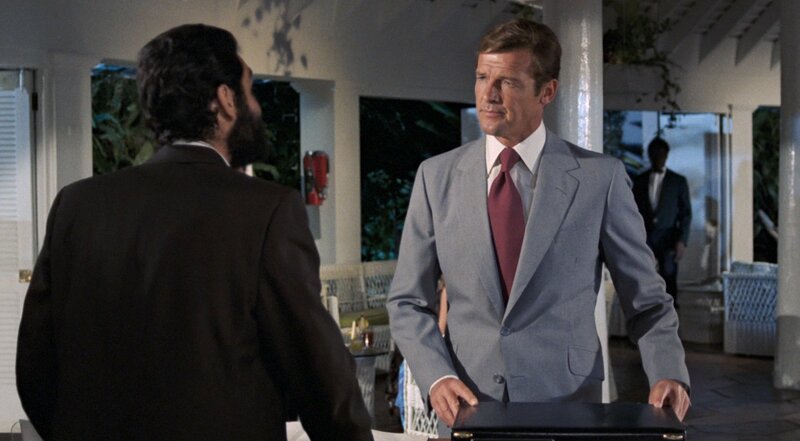 Moore’s beige suit is linen and entirely appropriate for the hot weather of the fictitious Caribbean island of San Monique in Live and Let Die. Moore’s medium brown suit is Donegal tweed to make up a classic hunting suit in Moonraker. 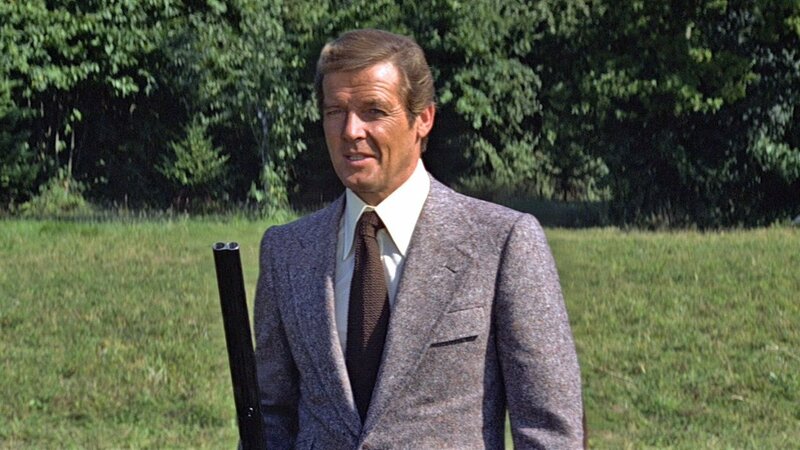 Roger Moore had a warm complexion, and despite the earth tones seeming dated to the 1970s, they were the best colours on him. Times changed considerably from the 1970s to the 1980s. In the 1980s, Moore’s suits became not only more traditional but were also made of more traditional cloths. For London the suits are grey and blue woollen flannels and heavier worsteds, sometimes with chalk stripes. In warmer locations abroad, the suits are various shades of tan in gabardine wool, a warm-weather classic. He wears evening wear in classic wool barrathea for black and midnight blue and linen for his ivory warm-weather dinner jackets. 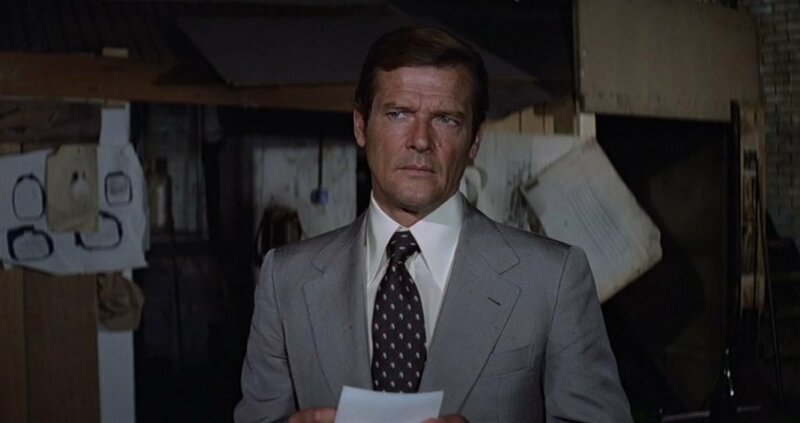 While the suitings that Roger Moore wore in the 1970s had many similarities to the suitings that Sean Connery wore in the 1960s, Roger Moore’s 1980s suitings were more similar to what men in the 1940s were wearing. There’s no doubt that Moore’s 1980s suits are more conservative than his 1970s suits, and in many ways this reminds us of the pared-down suits that Connery’s Bond wore before him. On the other hand, Moore’s 70s silk and mohair suits have at least as much basis in Connery’s Bond suits, despite often having bolder colours and more raffish cuts. For odd jackets, Moore’s have ranged from cotton to silk blends to tweed, in earth tones or grey. His quintessential blue blazers are made of worsted wool in hopsack or serge weaves. While Connery often wears cool-weather blazers made of doeskin in warm places, Moore’s worsted blazers are much more appropriate for many of the warmer places he wears them. I can’t tell if I prefer Moore’s suitings over Connery’s due to personal taste or because of better quality film. You got to love the the elegant evil of cyril castle on moore…. Dear Matt, came across this on ebay and figured you might what to have a look. One picture has a great look at Cyril Castle’s kissing cuffs. Quite a Roger style suit! I’m curious of of something though. I’ve never heard of Castle’s kissing cuffs called fishtail cuffs, and I wonder where the seller got the name from. I haven’t heard it before either. Castle’s apprentice Richard Paine called them flared cuffs. Love Roger’s suits in the 70s films, from Cyril Castle to Angelo. I especially like his wardrobe in TMWTGG. The blazer is perfect, too. If the film has shortcomings, the wardrobe does not. Mind you, having said that, I do love the film too; I’m just aware that I appear to be in a minority of one. No, you’re not! Christopher Lee out-gadgeting Bond with his own flying car, impossibly exotic locations (for an eight year old in grey old Croydon especially), quirky sidekicks, Britt Eckland..what’s not to like? Incidentally, what are people’s thoughts on what sort of Bond Christopher Lee would have made? Undoubtedly more akin to his step-cousin’s original vision (and with impeccable credentials with his war service in ‘ungentlemanly warfare’), he would certainly have been a more imposing, sombre character – one thinks of Patrick McGoohan turning down the role for being ‘too silly’ – but an extremely elegant one. Would the franchise have taken off so successfully, however? Probably not, but it’s fun to imagine.